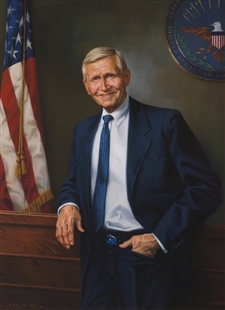 Bob Stump chaired the Veterans’ Affairs Committee for six years, and this portrait by artist Michael Del Priore commemorates that service. 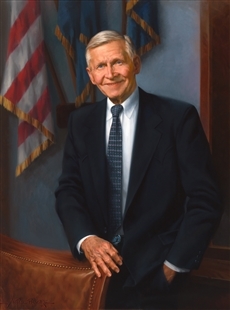 Two years later, the House acquired a remarkably similar portrait that marked Stump’s chairmanship of the Armed Services Committee. Both show the subject in a similar pose, leaning to one side, left hand in pocket. Also present in the two paintings are the same turquoise-and-silver belt buckle, a reminder of Stump’s western origins.